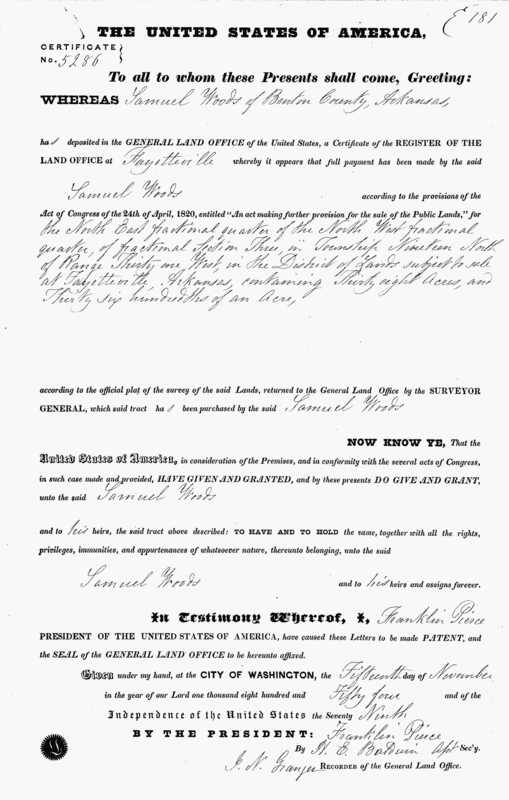 Samuel was born on 4 NOV 1799 in Madison County, Georgia, the son of Francis Harper Woods and Martha Leeper. He died on 23 SEP 1871 in Benton County, Arkansas. His wife was Sarah Adams, who he married on 28 JUL 1818 in Bedford, Tennessee. Their nine known children were Francis Newton (1819-1844), Mary Ann (1820-1890), Martha E. (1822-1886), Robert Washington (1824-1851), Samuel Leeper (1827-1845), James D. (1831-1907), Elrena Adaline (1833-1914), Thomas Allen (1836-1921) and Alexander Patton (1838-1863). Family Bible of Samuel Woods. Set of six Scott’s Bible Commentaries purchased by Samuel Woods Aug 16, 1857. The Holy Bible containing the old and new testaments, acccording to the authorized version with Explanatory note, practical observations, and copious marginal references. Boston: Samuel T Armstrong, and Crocker and Brewster. New York, J Leavitt. 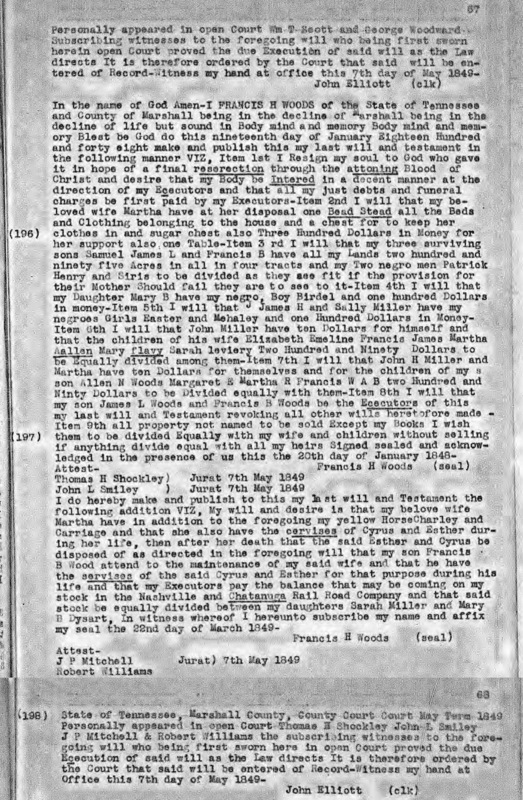 Address: Sugar Creek Twp, Benton County, Arkansas family 511 Samuel Woods, 50 m Farmer Tenn, James “ 20 m Tenn, Alrena 17 f Tenn, Thomas 16 m Tenn, Alexander 12 m Tenn. Address: dwelling 468 family 463 Woods, Samuel 70, mw farmer $15,000 $4,000 born Georgia - Allen 34 mw farmer $250, tenn, Mary 30 fw keeping hours Arkansas, Elevena 37 fw keep house Tenn. 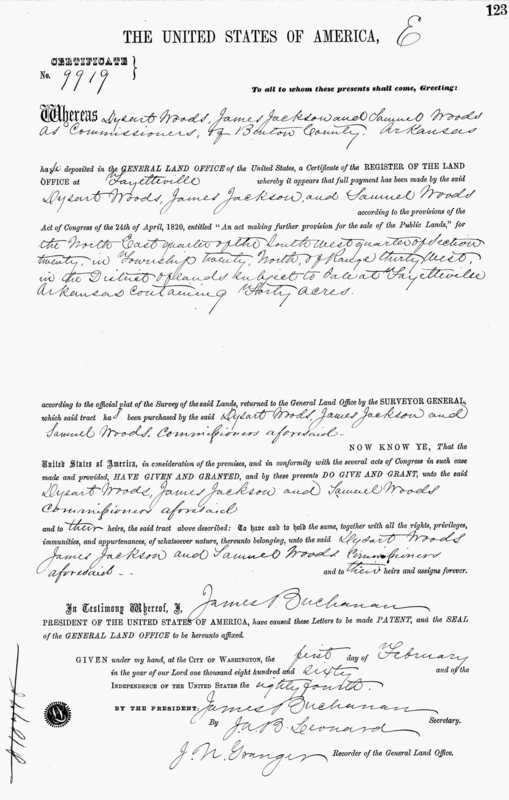 Deed 9919, Woods, Dysart, Samuel and Jackson J. 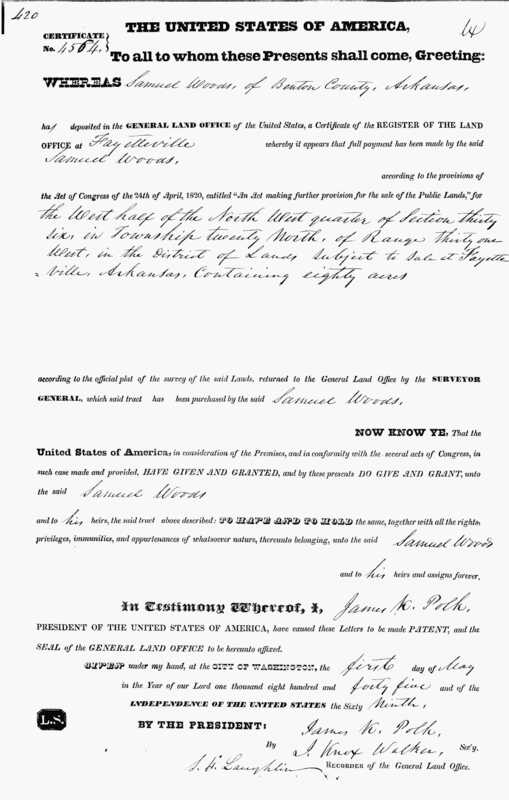 Deeds and grants show as Samuel Woods, including 1841 that has both Samuel Woods and Samuel Purviance Woods. 1870 census has them living close together in Osage twp. 1 May 1845 Samuel Woods both several parcels including 3 of 80 acres each of 3/4 of west half of section 36. that is west of modern SW “O” street from highway 72 south 1 mile to highway 102 (SW 14th St) and west to Jackson Lake and a portion of Tunbridge Dr to 10th..
Samuel Purviance Woods 1809-1882 buried Woods Cemetery, Little Flock and Samuel West Woods 1799 and 1871 is buried Old Dickson Cemetery, Bentonville. Sammie West was nickname according to one older source..
T. Allen Woods, a veteran of the Civil war, for years lived retired near Bentonville after many years of active connection with farming interests of Benton county, his energy, perseverance and industry in former years having won for him a substantial competence which enabled him to spend the evening of life in the enjoyment of a well earned rest. He was a native of Tennessee, his birth having occurred in Bedford county on the 2d of May, 1836, and he had reached the eighty-fifth milestone on life's journey when he departed this life on October 20, 1921. His parents were Samuel and Sarah (Adams) Woods, the former a native of Georgia, while the latter was born in North Carolina. They were married in Bedford county, Tennessee, where the father resided for forty years, and in April, 1840, he arrived in Benton county, Arkansas, casting in his lot with its pioneer settlers. He became one of the largest landholders of the county, owning at the time of his death a tract of twenty-seven hundred acres. He was a member of the Presbyterian church and in his political views was first a whig, while later he gave his allegiance to the democratic party. He died on the 23d of September, 1871, having long survived his wife, whose demise had occurred in Missouri in 1839. They were the parents of ten children, and the subject of this review was the last member of that family to die. The paternal grandfather, Franklin Woods, was a native of North Carolina and with his wife, who was in her maidenhood, Martha Leaper, he removed to Bedford county, Tennessee, in 1880, and there he died. In the country schools of Benton county, Arkansas, T. Allen Woods acquired his education and in 1862, when a young man of twenty-six years, he entered the Confederate army, becoming a member of Company G, and of its original complement of one hundred and one men but two are living today. 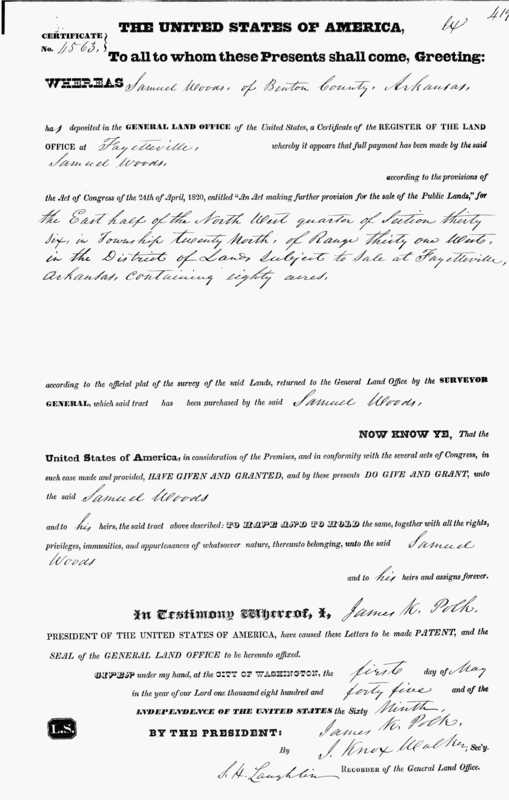 T. Allen -Woods served in Texas, Louisiana and Oklahoma and received his honorable discharge on the 29th of June, 1865. His younger brother, Alexander Patten Woods, also fought in the Civil war, losing his life in 'the service. On again taking up the duties of a civilian T. Allen Woods turned his attention to farming, continuing to follow that occupation until his retirement fifteen years ago and gaining that expert knowledge which can only come through long personal experience. He equipped his place with all of the newest devices in farm machinery, erected substantial barns and outbuildings and brought his property to a high state of development. He became the owner of extensive holdings, the greater part of his land being covered with timber, but he had disposed of mast of his property, retaining but sixty acres. He also had other business interests, being a stockholder in the First National Bank of Bentonville. On the 22d of November, 1859, Mr. Woods was united in marriage to Miss Mary Trout, a native of Madison county, Arkansas, and a daughter of John L. Trout, who came to Arkansas in 1830, and died in Benton county. No children were born to this union, but Mr. Woods had a nephew, Dwight Dickson, who is living retired in Bentonville, another nephew, John W. .Woods, is residing in Pea Ridge, Arkansas, and two others, James A. and W. H. Woods, are residents, respectively, of Centerton, Arkansas, and Canyon, Texas. He also had three nieces, Sarah Black and Isabella Lambreth, both of whom are living in Texas; and Maggie Woods, who is living in Arkansas. Mr. Woods was a member of the Presbyterian church and Mrs. Woods belongs to the Cumberland Presbyterians. His political allegiance was given to the democratic party. For eighty-one years he resided in Benton county and witnessed the entire growth of this section of the state, his memory forming a connecting link between the primitive past and the progressive present. In the work of deveIOpment and upbuilding he bore his full share and the family name is inseparably associated with the advancement of the state along agricultural lines from pioneer times to the present. His course was characterized by integrity and honor in every relation, commanding f0r him the respect and goodwill of all with whom he had been associated. Box 28 Woods S. P. 1892 Estate Admin: Maxwell A. J. Box 7 Woods, Samuel 1871 Estate Admin: Woods T. A. Box 10 Woods, Samuel 1878 Estate Admin: Woods, T. A. Box 12 Woods, Stella 1879 Curator Order Stroud A. B. Box 105 Woods, T. A. 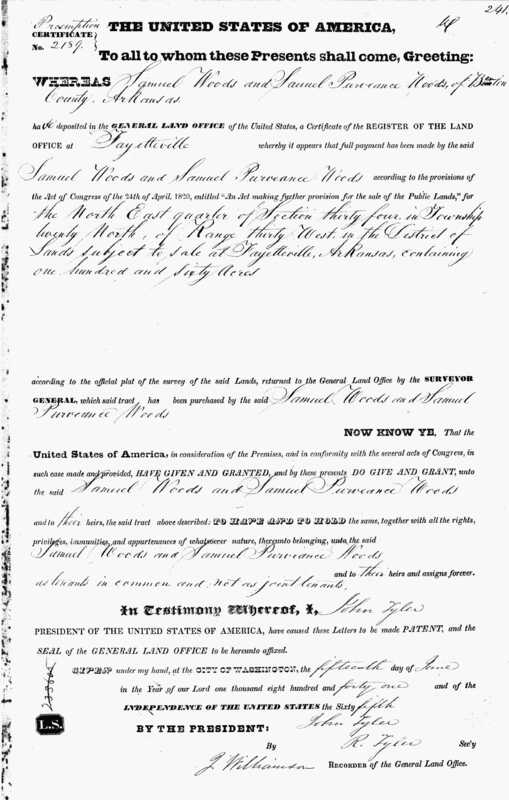 1921 Estate Admin: Dickson D. R.
I have added “East” or “West” as middle names and nicknames to the Samuel Woods of Benton County Arkansas in 1830s-1840s. Not real names, used here and other researchers to help identify the two large, intermarried, families. A Bowie. 1840 Census images on Ancestry.com has 6 images for pages 17 to 19 of Osage Township, Benton County, Arkansas that are incorrectly indexed as Bailey Township.